Workhorse inked a deal this month to sell UPS 125 new all-electric trucks. Image source: Workhorse. "An army marches on its stomach," Napoleon Bonaparte once said. Without food, an army grinds to a halt. Similarly, the army of package and parcel deliverers at United Parcel Service (NYSE:UPS) marches on... diesel. Last year, the world's largest package delivery company spent nearly $3.9 billion on fuel for its transportation fleet. That's a lot of gas money. But without fuel, 100,000-odd UPS trucks, vans, airplanes, and other delivery vehicles would sputter and die -- and that makes fuel costs a life-and-death matter for UPS' bottom line. To mitigate the fluctuating (but historically upward-trending) cost of fuel, and help save the world from global warming in the process, UPS is taking measures to improve its fuel efficiency and cut emissions. Last week, the company announced its latest move: the purchase of 125 "new technology hybrid electric delivery trucks" from Cincinnati-based Workhorse Group, Inc. The trucks, which marry a "very small internal combustion engine" to a lithium ion battery (sort of like in the Chevy Volt), combine to give each truck a 50-to-60-mile range per day. Workhorse says they're "designed specifically to meet the stop-and-start needs of UPS's urban delivery routes." Now, 125 trucks will shift the "green" balance on UPS' truck fleet by barely one-tenth of 1 percent. But Workhorse is hardly UPS' first ride at this rodeo. 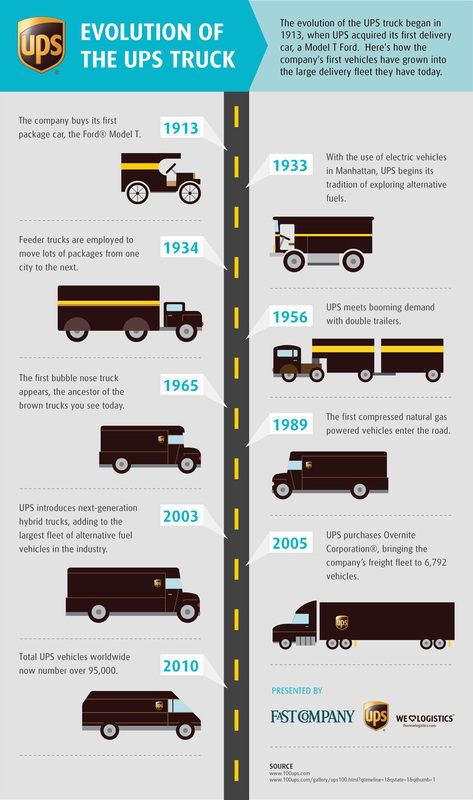 UPS has been experimenting with electric vehicles as far back as 1933, and began introducing hybrid gas-electric trucks into its delivery fleet in 2000. Today, out of a worldwide motorpool of "99,892 package cars, vans, tractors, [and] motorcycles" (i.e., not counting UPS' LTL truck fleet of 5,733 tractors and 19,880 trailers), more than 5%, or 5,000, of UPS' vehicles are classified as "green" -- running on such alternative fuels as compressed natural gas (CNG), propane, and liquid natural gas, or on electric or hybrid-electric drivetrains. Granted, even 5% isn't a huge proportion of the fleet. But consider this factoid: As of 2010, only 1,914 of UPS's 99,795 delivery vehicles were considered "alternative fuel." That means that, as growth in UPS' overall delivery fleet has remained roughly flat, the company's "green fleet" has grown more than two-and-a-half times -- and it's still growing. Earlier this year, UPS announced plans to put 1,400 new CNG trucks on the road by early 2016. Once this plan is fully implemented, this will increase UPS' green fleet size by 30%, from 5,088 such vehicles, to nearly 6,500 -- about 6.5% of the fleet, and more than triple the size of the alternative fuel fleet of 2010. That's a lot of numbers... but what does it mean for the bottom line? All of this sounds like good news for Planet Earth. But what does it add up to in dollars and cents? As much as I'd like to tell you that UPS' efforts are making headway, and were directly responsible for UPS' big earnings beat last quarter, the truth is that they weren't. In fact, all the effort that UPS has been putting into the greening of its fleet appears to be having very little effect on the bottom line. Data source: UPS SEC filings, U.S. EIA data. Chart by author. Now, none of the above is to say that UPS' green energy efforts have been futile. I'm sure, for example, that UPS' public announcements of its greening of the fleet have helped to burnish its image. Such PR has value, and the actions behind the PR may also have a tiny effect on reducing global greenhouse gas emissions. It's also likely that, had UPS chosen to stick with a mostly diesel-powered delivery fleet over the past five years, the company's fuel costs would have spiked even higher. Switching part of the fleet to "green fuels" may have at least mitigated the damage for UPS. But as far as UPS' all-important goal of cutting fuel costs goes, despite converting 5% of its fleet to "green energy" already, and despite plans to buy more electric and cheap-natural-gas vehicles to continue the conversion effort, so far, UPS has seen precious little reduction in fuel costs for its fleet. Electric trucks haven't done the trick. Maybe UPS should try to cut fuel costs with electric airplanes? Image source: UPS.